Don't you want to know what the inside of these homes look like? Small museums give you entree. 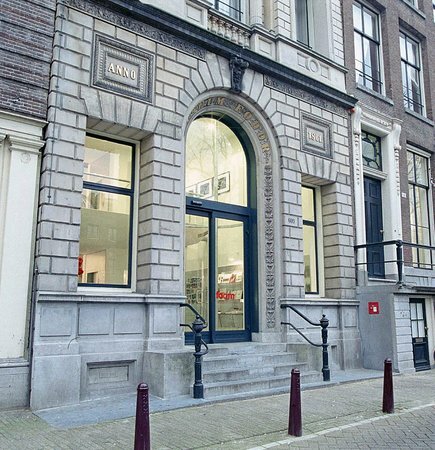 Smaller museums are often overlooked in cities like Amsterdam where travelers allot perhaps two days to see and do what could take a month to cover. Too bad because many are a treat. A treat but potential challenges for us Levelers. I decided to find out which are worth the effort. It was my money and my time so I began with those that most appealed to me. 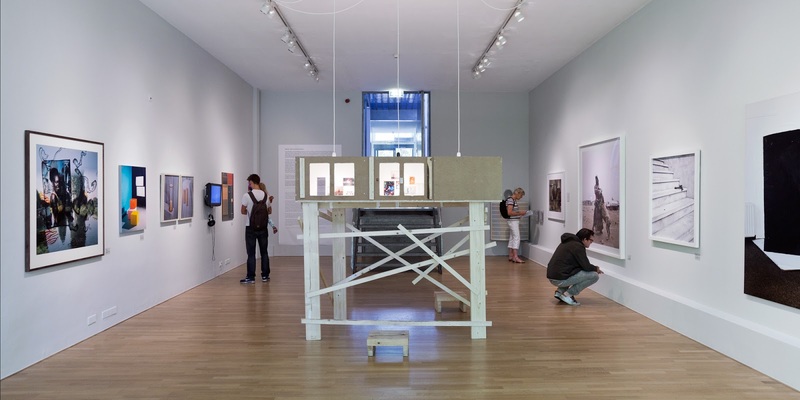 I concentrated on truly smaller museums, eliminating those in large, more public facilities because they are more likely to be fully accessible. Foam, which deals with all things photographic, is artfully slipped into a traditional canal setting with a distinctly contemporary interior. Tip: There are elevators to each floor, but within each you will encounter different levels; no more than seven steps though. The two exhibits I examined were both excellent. Early color photographs by Jacques Henri Lartigue, whose photographic obsession began in 1901 when he was seven, were a surprise. One does not expect color so early. 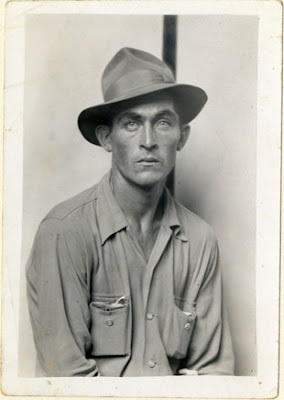 The vintage black and white prints of American Mike Disfarmer, presented visitors with simple studio portraits of the residents of Heber, Arkansas, from 1930-50. The work of Helmut Newton will be featured during the summer, 2016. The Van Loon Museum, home of the family of a co-founder of the Dutch East India Company. Almost directly across the Keizersgracht Canal from Foam is the elegant Museum Van Loon, an opportunity to see inside one of Amsterdam's grand canal homes. 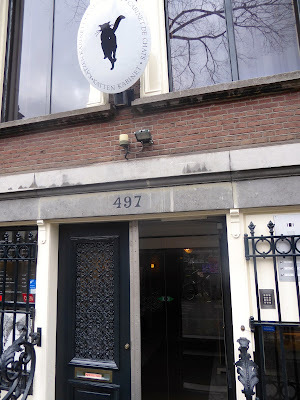 Willem van Loon was co-founder of the Dutch East India Company in 1602, his grandson was Mayor of Amsterdam and in in the early 19th century the family was elevated to nobility, becoming wealthy bankers. 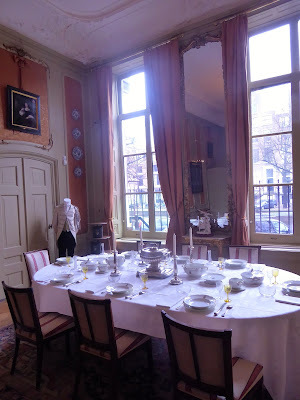 The house was built in 1672, first lived in by a student of Rembrandt, its interior redone in the mid 18th century and purchased by the Van Loons in 1884 as a wedding present for their son, Willem Hendrik van Loon, and his bride, Thora. It was opened to the public in 1973 but the family still occupy the upper floors. Warning: There is no elevator but I found it worth the effort. I will list the number of steps as I go along. The dining room could seat 24 when the table was extended. The home is unusually spacious for its time, especially the high ceilings and grand staircase. Visitors are given a small pamphlet to aid in their self tour. There are changing exhibits from the family's collections; in March, it was clothing. In June Foam will provide the exhibit. The garden and carriage house. As one might expect, the dining and drawing rooms are quite elegant, but it is the garden room that is an eye opener to most foreign visitors. The city radiates out from its ports and the houses along the semi-circular canals were designed with spacious gardens backed by stables extending to the next street. Each June some of these gardens are open to the public. Tip: There are 11 spiral steps to the bottom level kitchen which was headquarters for the family's10-15 servants. A sample menu included foie gras served for dessert. There are seven steps up to garden level. The copper beech was planted by the Van Loons in 1881. Seven steps will take you inside the Coach House where up to eight coaches and six horses could be stabled with room for the coachman and his family upstairs. 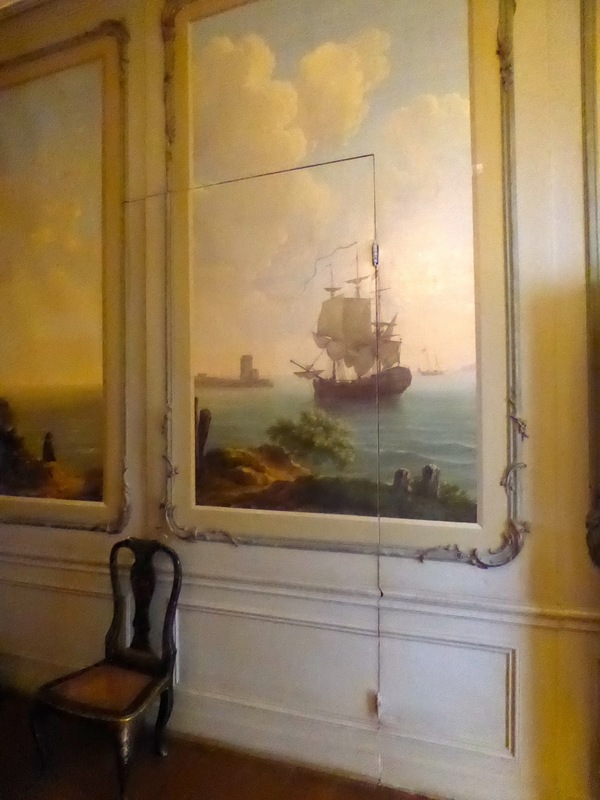 Painted wall hangings were purchased from Drakenstyn mansion. Back in the house you will encounter 16 steps to a landing followed by another 12 to reach the second floor bedrooms. 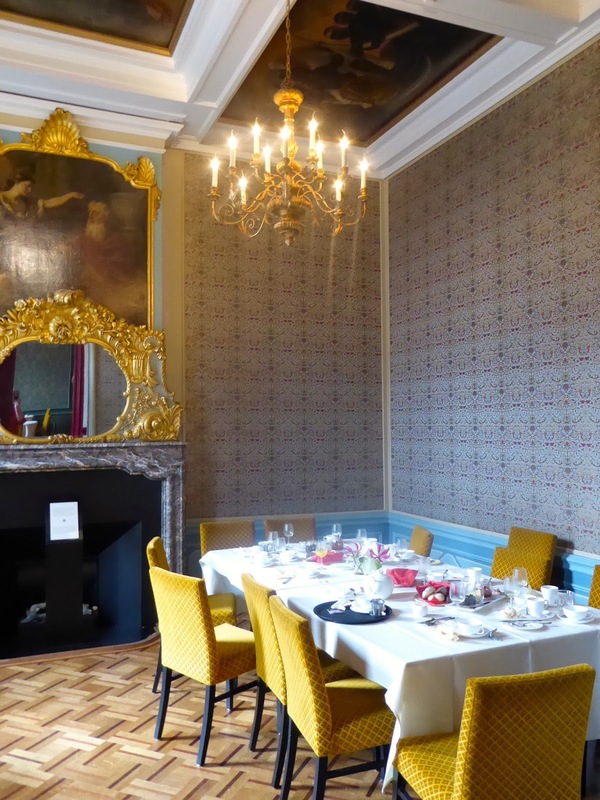 My favorite was the Drakensteyn Room with its painted wall-hangings that were rescued from the private mansion of HRH Princess Beatrix. 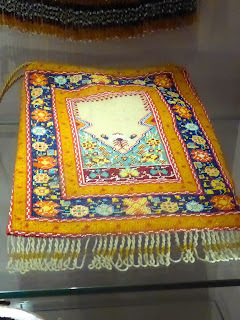 TassenmuseumHendrikje, Museum of Bags and Purses. I had heard good things about this, the largest museum of its kind in the world. It did not disappoint. 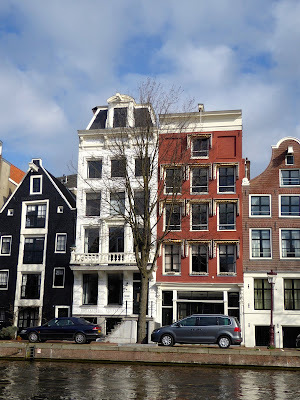 It is another opportunity to go inside a canal house, this originally a 17th century mayor's residence developed by Cornelis de Graeff on Herengracht, one canal closer to the port than Foam and the Van Loon. 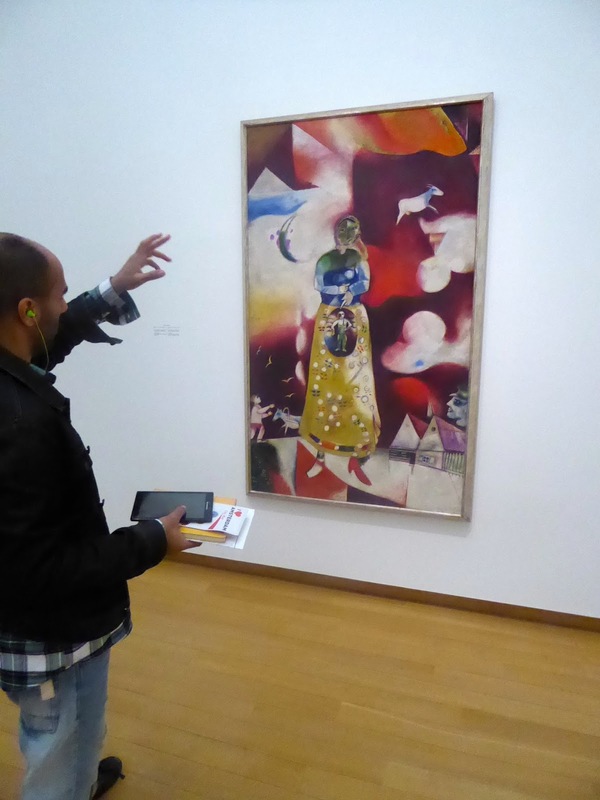 Tip: The elevator will take you to the 1st, 2nd and 3rd floors; you will have seven steps to the permanent collection on the 4th floor. The excellent shop and bathrooms are on the entrance level. Sixteenth century goat leather belt bag with 18 pockets. There are over 5,000 items in the permanent collection, some 1,500 on display at any one time. The historical survey begins at the 1600s with an 18-pocket goat leather belt bag and moves forward with each floor. Initially, both men and women carried purses until the 17th century when tailors began adding pockets to men's attire. Women's attire was so voluminous through the 19th century that they could carry two purses underneath, tied around their waist with strings, one to a hip. Thus the expression, "controlling the purse strings." Circa 1740 Netherlands chatelaine with needle case, scissors, vinaigrette and thimble box. 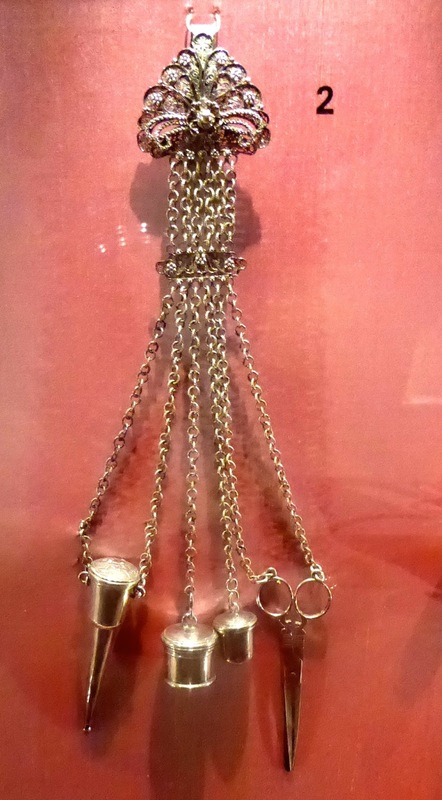 They had traditionally carried chatelaines, brooch-like affairs with items such as needle cases, scent bottles, keys and scissors, that doubled as jewelry. 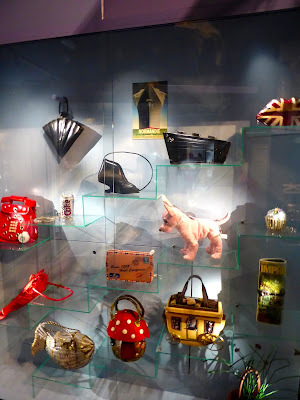 However, as purses and bags became both utilitarian and fashion statements, they became works of art as well. 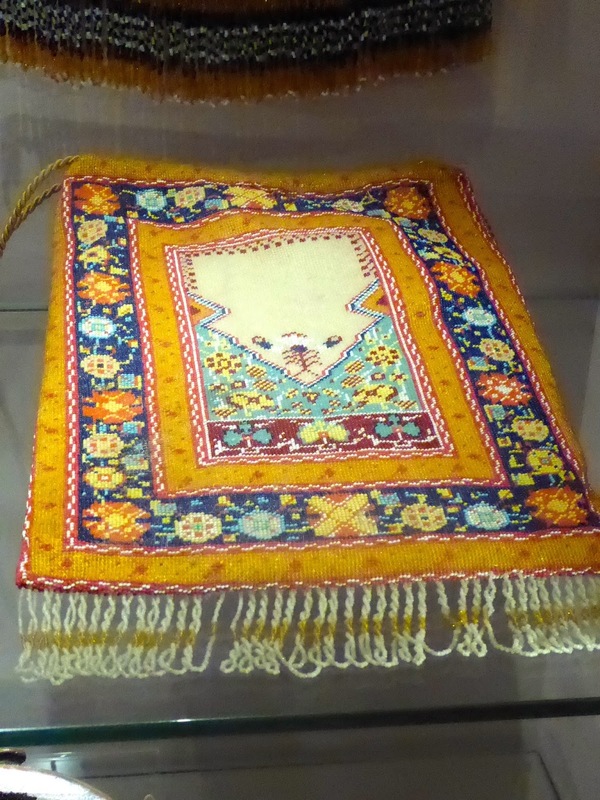 As new materials were developed, women's purses and bags were produced in them, expanding both utility and creative expression. and the Lanvin evening bag made for Elizabeth Taylor. From bags and purses just off the runway to novelty themed ones large and small, you will find it here. Dine on lunch or high tea in a period room. If you become hungry or thirsty, there is a charming cafe on the 1st level as well as two period rooms with painted ceilings that can be reserved for lunch, high tea or private functions. Entrance to the cat museum. Also on Herengracht is Kattenkabinet, The Cat Museum. I had wanted to visit it since spying its sign during a canal cruise a number of years ago. What a disappointment. It, too, is in a canal house, but everywhere you turn are Keep Out signs. The steps are creaky and the railing loose, lighting is dismal, the sculptures, posters and paintings are hardly visible (although the dust is) and the staff act as if paying visitors are an imposition. Gift shop and its resident cat were my faves. The best thing about it is the small store and the tabby that calls it home. You can go in there for free. Don't waste your money on the rest. Another museum in a 17th century canal house is the Amsterdam Pipe Museum but I didn't make it there. 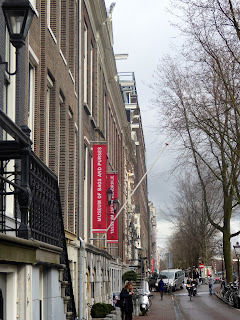 Amsterdam on the Level, part 3, will address what I didn't see but put on the list for next time and the city's most popular attractions according to the tour companies. 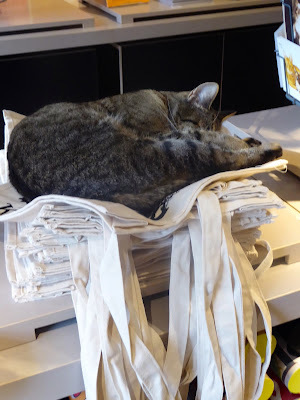 In part 4 I'll tell you about what I did on the one sunny day after four of gray, rain and cold. Can you say best bulb plants? You would think that a small country like the Netherlands which is either at sea level or below would be heaven for Levelers. It is, outdoors. Inside, well, consider this. The Dutch ruled the seas and trade in the 16th and 17th centuries, creating untold wealth. All the money and dikes in the world could create only so much land, though. Space was extremely limited; houses were narrow and went up, three, four, five stories high with the least possible area sacrificed to stairways. 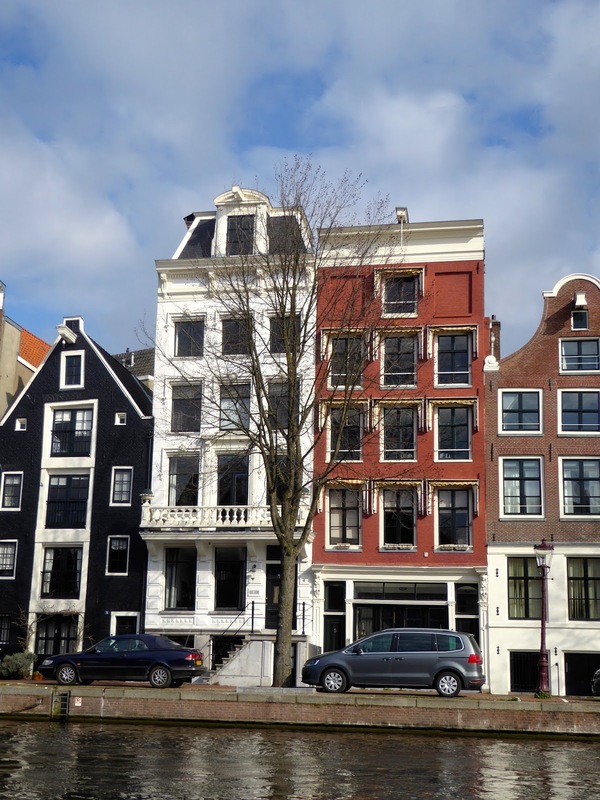 The result in Amsterdam is a city Levelers find enjoyable to walk with buildings that can present major challenges. Tip: Make sure your accommodations come with elevators. Some of the smaller, less expensive ones don't. 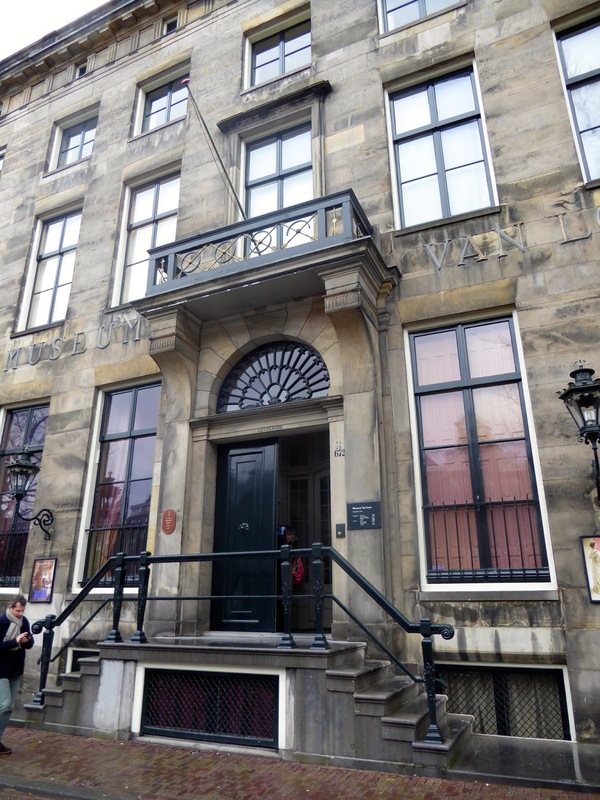 Fortunately, the Dutch have made many activities, larger museums and public buildings accessible. I recently spent several days checking out those facilities including some of the smaller museums that are well worth your time. Canal tours. Easily accessed; an easy step onto the boat, a few small steps down. By all means take one. Rijksmuseum. A don't miss and after several years of work in updating the facility it gleams. Always, always, get your tickets in advance, before you leave the States, and arrive early. It opens at 9 a.m. on the dot. Follow the bicyclists through the portico; the entrance, a revolving door, is on your left. Tip: There are 21 steps down to the 0 level of the Grand Hall, where you must start, but there is an elevator to the right of the ground level entrance. 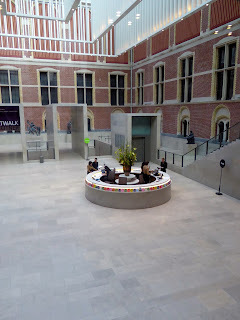 0 Level information desk, Rijksmuseum. When you reach 0 level you will see an information desk ahead of you. Bathrooms, coat check and cafe are accessed from here. The attendant who scans your ticket is across to the left, elevator to the upper levels to the right beyond him. Exhibit wings surround the Grand Hall space. I always recommend starting on the top floor and working down to avoid the crowds. You will be working from the most recent works on display to the oldest. The Vermeers come first, then the Rembrandts. Tip: Elevators will be in the middle hallway. Rembrandts and Vermeers are on Level 2. From Level 0 the gift shop is 12 steps down, another set go to the children's shop. Lockers are six steps down, bathrooms four from there. The Cafe is up but there is an elevator. Watch a period fashion show at the "Catwalk" exhibit. 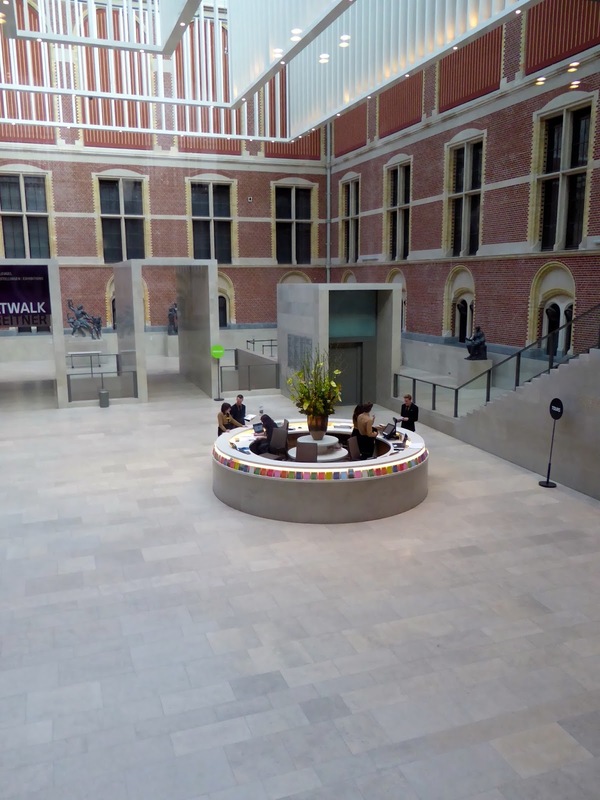 If you will be in Amsterdam before May 19, 2016, I strongly recommend the "Catwalk" exhibit on Level 2. Designed by Dutch photographer Erwin Olaf, it highlights items from the museum's extensive costume and fashion collections, which most of us never knew it had. Highlight was the catwalk portion, a recreated fashion show with rows of chairs on either side of a conveyor that slowly and elegantly circulated mannequins attired in superb 19th and 20th century fashions. Great fun and a good break for the feet. 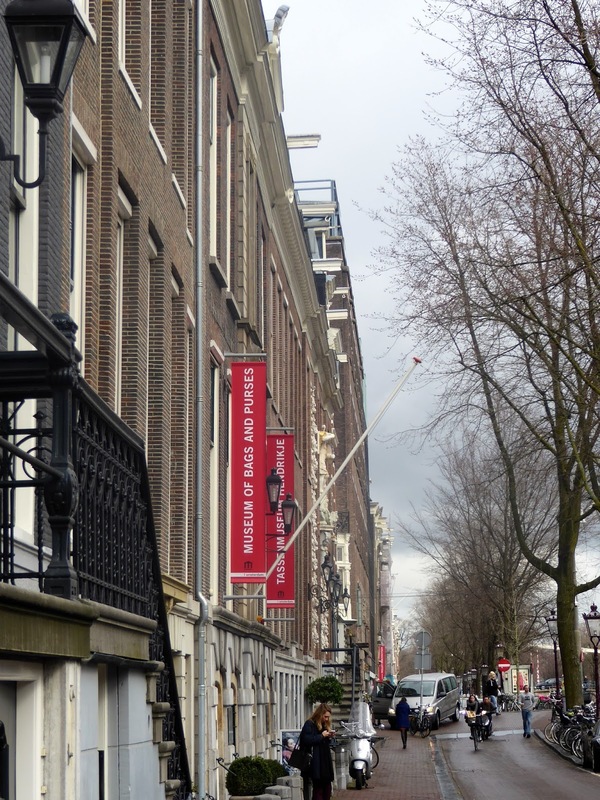 Across from the Rijks on the Museumpleine, you will find the Van Gogh Museum and the Stedelijk Museum for modern and contemporary art. Crowds are a problem outside and inside the Van Gogh Museum. Getting into the Van Gogh Museum will be your biggest and most annoying challenge. Even with an advance ticket there were long lines "Disneyd" along stanchions when I arrived 5 minutes after it opened. The museum simply is not designed to accommodate the crowds trying to enter. All I can recommend is get that ticket in advance and arrive before opening. When you get in, go to the top and work your way down from Van Gogh's last work to his first, trying not to succumb to claustrophobia. Tip: Fortunately, there are escalators down to shop, coat check and bathrooms and elevators to the upper floors. If you arrive before June 19, 2016, another strong recommendation is to stop by the special exhibit "Easy 'Virtue" before you leave. It is a rarely done look at the Belle Epoche's ladies of the evening as portrayed by first tier artists such as Toulouse Lautrec, Courbet, Van Gogh, Picasso, and Kees van Dongen. A Chagall fan at the Stedelijk. Stedelijk Museum won't be everyone's cup of tea but I found the fabric designs by Picasso, paintings of Appel, Kandinsky, Mondrian, Redon, Cezanne and Chagall, as well as the design work on everything from Apple computers to chairs and lighting worth the time and effort. Micropia is the only museum about microbes in the world. Besides being unique, it is a lot of fun. 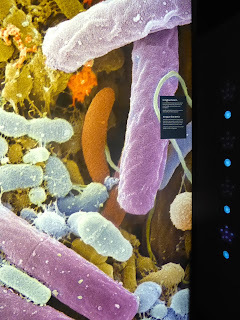 Who knew what different microbes look like or that the microbes that eats your tooth enamel are killed by the exoskeletons of microbes in your toothpaste? That we share microbes with our pets? Fascinating stuff, really. Who knew microbes were this colorful? Warning: You will be ushered up in an elevator, but will have to either walk down the stairs to leave or ask an attendant to go downstairs, bring the elevator back up and let you use it to go back down. Something about programming. 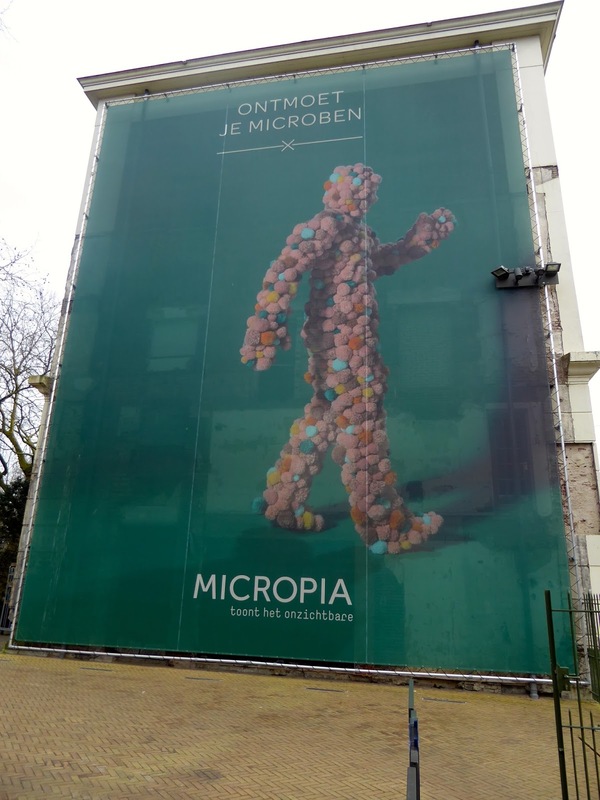 How many microbes are you carrying around and what do they look like?